DMC is holding a unique new opportunity for resident recruitment at the MGM Grand on October 7, 2015 from 6-8 PM. This is an excellent way to seek primary care opportunities in the area. 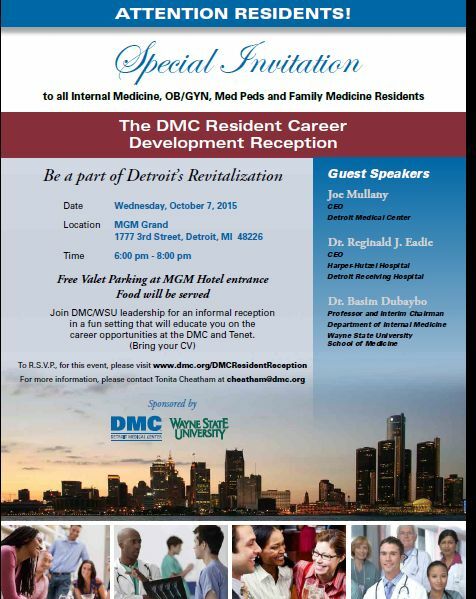 The event is open to all primary care residents at all DMC campuses, and all Detroit area hospitals. (Note, Tenet does have job opportunities nationwide which will be discussed for those who may want to move out of state).